The death toll in the Philippines from Typhoon Mangkhut has climbed to 81 and could hit triple digits as searchers dig through a landslide where dozens are presumed dead, authorities said..
South China regions including Guangdong, Hainan and Guangxi Zhuang Autonomous Region were affected by strong gales and heavy downpours on Sunday morning. A super typhoon made landfall in China's Guangdong on Sunday, the country's most populous province, after barrelling past Hong Kong and Macau and killing at least 29 people in the Philippines. 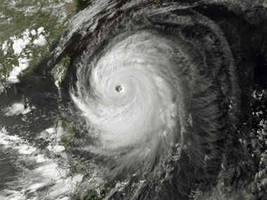 A super typhoon swirled past Hong Kong on Sunday, barrelling towards the Chinese coast and gaining strength over the South China Sea after it wreaked havoc in the Philippines and killed at least 29..
Super Typhoon Mangkhut - the biggest storm of the year - smashed through the Philippines on Saturday, and claimed its first death as a woman was swept out to sea off Taiwan. The typhoon made landfall before dawn in the coastal town of Baggao in Cagayan province on the northern tip of Luzon Island, a breadbasket of flood-prone rice plains and mountain provinces often hit by..
Philippine authorities started to evacuate thousands of people from coastal areas on Thursday as a super typhoon with winds of more than 205 km per hour bore down on the country's main island. A powerful 6.6 magnitude quake hit the northern Japanese island of Hokkaido early Thursday, the United States Geological Survey said, although no tsunami warning was issued. The relatively shallow..
Japan issued evacuation advisories for more than 1 million people and cancelled hundreds of flights in the face of extremely strong winds and heavy rain as typhoon Jebi made landfall along its west..
Jebi was briefly a super typhoon and is the latest harsh weather to hit Japan this summer following rains, landslides, floods and record-breaking heat that killed hundreds of people. There were..
Taiwan braced for super typhoon Maria on Tuesday, as airlines cancelled flights and the weather bureau warned against landslides and flash floods on the heavily industrialised island. Taiwan braced for super typhoon Maria on Tuesday, with some transport services suspended and the weather bureau warning of landslides and flash floods on the heavily industrialised island. One third of central Tokyo could be left under water and nearly four million people affected if a super typhoon strikes the capital causing storm surges, a new study from local authorities has..
Kai-Tak, packing gusts of up to 110 kilometres (62 miles) an hour, hit the country's third-largest island Samar in the afternoon and tore through a region devastated by Super Typhoon Haiyan four..
Over two lakh people have been evacuated from China's Fujian and Zhejiang provinces as Talim, the region's 18th typhoon this year, moves rapidly towards the country's southeast coast. The provincial..
TAIPEI/BEIJING (Reuters) - Taiwan issued a warning to ships and airlines cancelled some flights on Wednesday as the island braced for Typhoon Talim, which was expected to hit cities including the..
TAIPEI (Reuters) - Taiwan issued a maritime warning and airlines cancelled some flights on Wednesday as the island braced for Typhoon Talim, which was expected to hit northern cities, including Taipei,..
China`s National Meteorological Center on Tuesday warned that Typhoon Talim could intensify and turn into a super typhoon as it churns towards Taiwan and Zhejiang and Fujian provinces on the Chinese.. The glitzy exterior of Macau crumbled after a super typhoon steamrolled through the gambling center, exposing critical infrastructure flaws and overwhelmed emergency services. Nock-Ten has intensified into a super typhoon with maximum sustained winds of 175 kilometers (108 miles) per hour and gusts of up to 215 kph (133 mph) and it heads for landfall over Cataduanes Island..